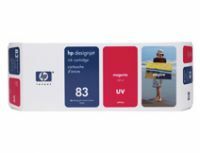 C4945A Six UV-resistant ink colours and HP's Jetexpress technology combine to help bring durability, unrivalled print speeds, and ultimate photo quality to production printing. HP 83 UV Ink Cartridges achieve color-rich images on a variety of media. Patented, pigment-based inks are durable and fade resistant and are designed with the printer to ensure uncompromising print quality, performance, and reliability. 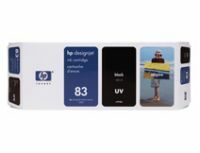 HP 83 UV technology achieves smooth color transitions. Ink formulations support instant dry time to increase productivity and facilitate immediate lamination. HP inks and media work together to produce images that resist fading for over 100 years. Unrivalled print speeds. Get fast, no-compromise inkjet printing with HP 83 UV Printheads and HP 83 UV Ink Cartridges. To Recieve updates and possible rewards for Hewlett Packard (HP) HP 83 680 ml Light Magenta UV Ink Cartridge please sign in. To Recieve updates and possible rewards for Printer Cartridge, Ink & Toner please sign in.